Sevilla - 700,000 inh. (1.4 mill in metropolitan area); capital of Andalusia in southern Spain. After the construction of the first line of a full 3-line metro network began in the late 1970's the project was suspended in 1983 due to fear that historical buildings might be damaged in the city centre. 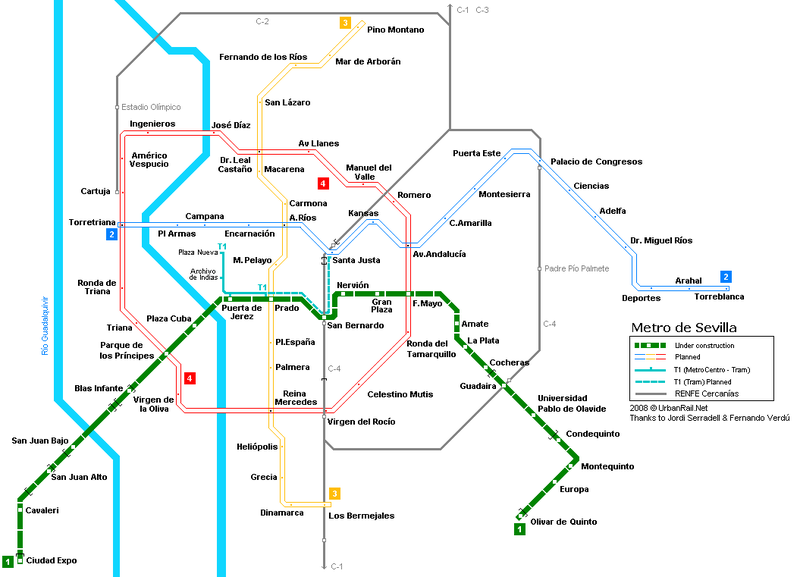 The then completed section included the stations from Nervión to La Plata and the running tunnels between them, plus several elements in the historic city centre. 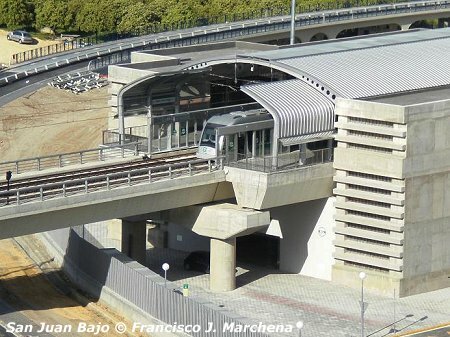 The initially planned line was to run between Nervión and Puerta Jerez in a straight alignment, but it was later diverted to serve Renfe's new underground station at San Bernardo (which replaced the former Cádiz railway station closed in 1992 when Santa Justa station opened and the cross-city railway line was put underground). From Puerta Jerez, the metro line was to continue northwards through the old historic centre, with underground stations at Plaza Nueva, Duque, Alameda de Hércules and Macarena. With metro construction booming in Spain (especially in Madrid and Bilbao) during the late 1990's, the Andalusian government rediscovered the need for improved public transport and began planning the construction of a light rail network, similar to a Premetro/Sneltram system with certain routes in tunnel (especially that built in the early 1980's in eastern Seville) but other stretches running on street level. 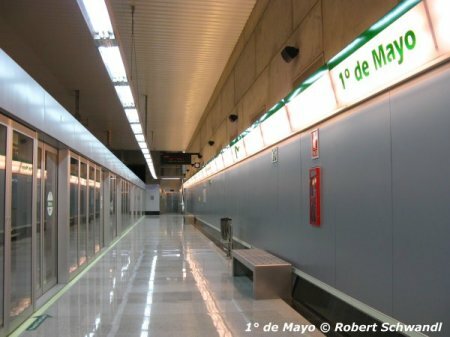 Construction of Line 1 (18 km, eventually 22 stations) was finally awarded in March 2003, works began in 2003, and after some delays the opening of Line 1 finally took place in April 2009. The central section includes the tunnel built in the 1980's between Nervión and La Plata. Although initially planned to run on the surface, the southeastern segment through the municipality of Montequinto was eventually also built underground, so that the resulting line became 100% segregated from road traffic. 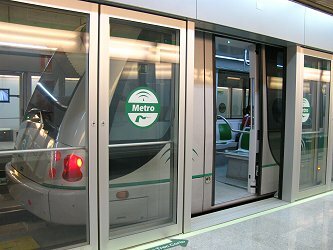 One year prior to opening, the decision was taken to install platform screen doors. Already equipped with ATP, the trains will run in ATO mode in the near future. 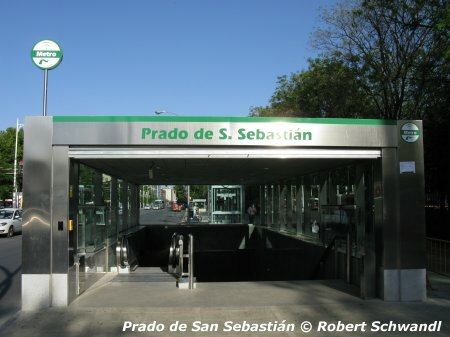 With the largest part of line 1 entering service in April 2009, Puerta Jerez station, which is located right in the city centre and only a short walk from the Cathedral, followed in Sept. 2009, while the remaining three stations at the southeastern end opened in Nov. 2009. Spanish manufacturer CAF delivered 17 articulated low-floor vehicles: 31 m long, 2.65 m wide, 3.3 m high. 1435 mm gauge, overhead power supply, 750V; 6 doors on each side; air conditioning; capacity: 192 passengers/vehicle (60 seated, 132 standing). 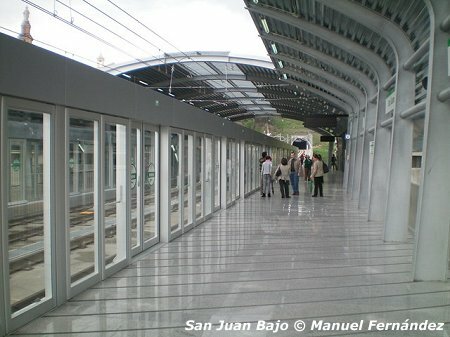 Stations were designed by the architects Enrique Abascal García, Miguel Díaz Zulategui and Ángel Díaz Domínguez with concrete, metal and glass as the dominant materials used. 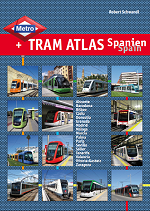 The colour green, Andalusia's national colour, identifies both the Metro as such and the first line in particular. Provisions were made for an additional station at Guadaíra, with interchange to Renfe's C-4 orbital line, but as this station would be located in as of yet undeveloped land, no dates for its opening can be given. Not too many details are available at the moment about the future overall network. See link below for latest news. 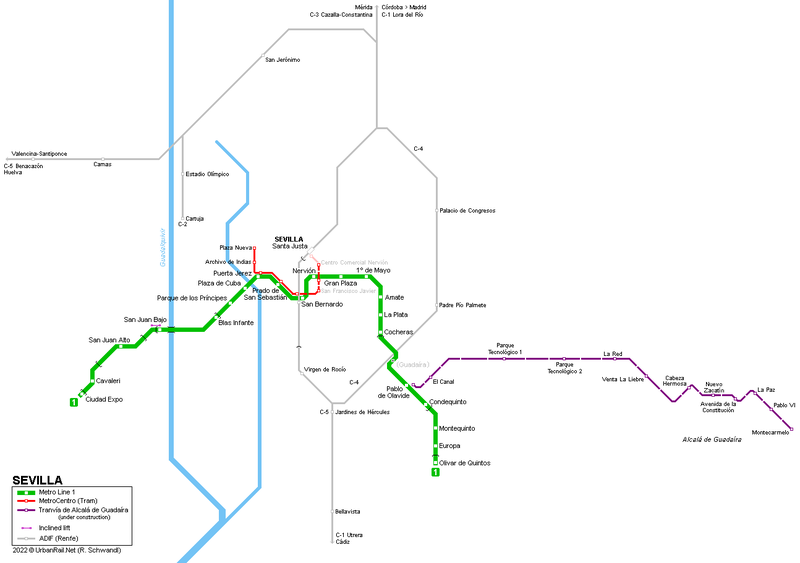 Line 1 - southern extension from Olivar de Quintos to Dos Hermanas, most likely to be built as a separate tram line. 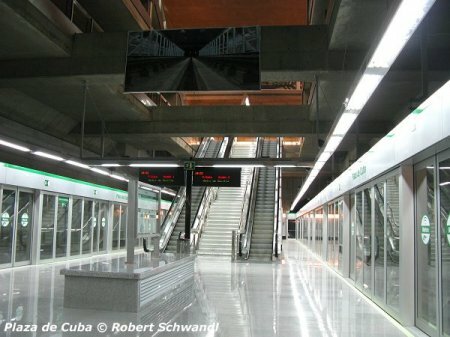 In the southeast of the metropolitan area, the Tranvía Metropolitano de Alcalá de Guadaíra has been under construction since 2008, although work was suspended and eventually resumed in 2015. 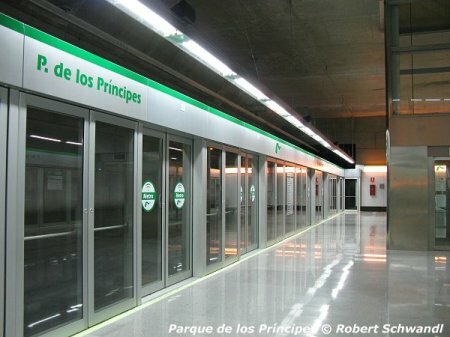 The line starts at Pablo de Olavide metro station, from where it runs east for 12 km through mostly undeveloped land to Alcalá de Guadaíra. In the end, it may as well be directly connected to the present metro line providing through service into the city centre.